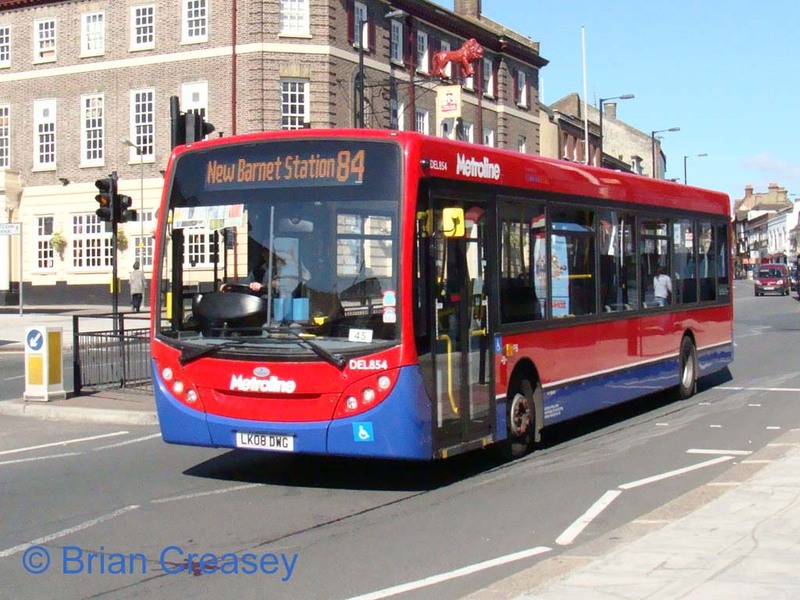 A once long line of routes operated under London Local Service Agreements, which are agreements whereby commercial services are incorporated into the Transport for London fares system, has now come to an end following the conversion of route 84 to a London Service Permit. TfL generally take the view that if a route contributes anything of value to London, and hence is worthy of the fares support that this arrangement provides, then it should provide it itself as a contract service. Routes operating wholly in London were quick to succomb, mostly being taken over by TfL albeit often in a revised format, and cross border routes did likewise. Many cross-border routes quickly became LSPs as in most case the section inside London was quite short anyway. But a few lingered on, until the 84 finally changed to an LSP to coincide with the TfL fares revision on 2 January 2012. In order to retain its status as a TfL supported commercial service the 84 had to be converted to low floor operation by April 2006. Although traditionally a double deck route, Metroline decided that single deckers would suffice – despite an earlier failed experiment with high floor single deckers that did not last long. Various surplus low floor Darts were drafted in. Most London buses are dual door but one exception was for Stationlink route 705, where single door vehicles were specified to provide more wheelchair spaces per bus. Being limited stop, the usual issues of passengers getting off delaying passengers getting on did not really apply. Anyway, after the 705 was withdrawn the buses were at a loose end for a while, but eventually the 84 provided a suitable home for them. These were topped up by similar, but dual door, vehicles. 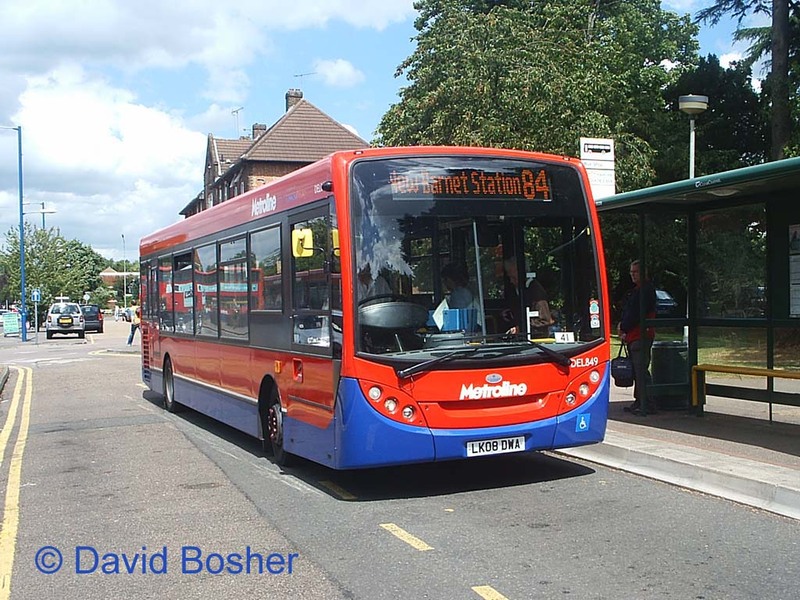 However, Metroline took the commercial decision to introduce new (and longer) buses for its two commercial routes operating from Potters Bar. A batch of 10.8m Enviro200Darts was obtained from dealer stock and entered service quite quickly. Although in Metroline livery they do not have standard Metroline interiors. Also of note are the LED dot matrix destination displays – although TfL requires traditional blinds on its contracted services, commercial operators can do as they please! Two photos have been obtained. The first shows DEL849 (LK08 DWA) opposite Potters Bar garage on Saturday 5th July 2008. Second is DEL854 (LK08 DWG) in Barnet on Friday 15th August. Dot matrix displays have often been problematic for photographers, as they often flash meaning they may be "off" when the shutter is opened, but these two are quite clear. As an aside, the DLFs displaced by the new DELs were due to be converted to driver trainers, despite their relatively youthful age. Changes to PSV driving test regulations mean vehicles must be fitted with ABS braking (which seems the wrong way round to me! ), and only newer buses such as the DLFs have this. The 84 has the dubious distinction of being the last regular London route to have operated not one but two types of double decker. The first of these was the relatively insignificant Scania N113 based double deckers built in the early 1990s, of which 71 were ordered by London Transport. The vehicles in question were S11-20, with Alexander RH bodywork, which were originally ordered for the Docklands Express, and subsequently transferred to London Northern for the new 'Red Express' route X43. When this regrettably ceased operation in 1997, the Scanias transferred to Metroline's commercial routes (84, 242, 310A/310B) working alongside Metrobuses, and latterly were mainly to be found on the 84. Much more significant in London's history was the Olympian, first the Leyland variety, and later Volvo models. Again the ones on the 84 were Alexander bodied examples new to Metroline, and had latterly been in use on route 260, before that was split and received new vehicles in June 2003, resulting in their transfer to the 84. When the main allocation was converted to single deck a few Olympians were retained for school workings (not entering London), and also for one journey run on London Service Permit conditions as route 84X. However, these were also swept aside with a timetable change on 07/06/08. The 84 is itself a bit of an anomaly, being one of the farthest reaches of “red bus” territory. Traditionally London Transport’s territory extended considerably further out than it does now, but operations were split between Central Buses, covering Greater London as we know it today, and Country Buses covering the more outlying areas. However, the boundaries were by no means precisely defined, and one Central Buses garage lay well in Country Buses territory. That was Potters Bar, and the result was that many routes in this part of Hertfordshire were operated by Central Buses, even though they would more logically have been Country operations. However, the 84 used to reach further into London. In 1936 it ran from St. Albans to Golders Green, albeit omitting Potters Bar itself by running via New Road. Meanwhile, new trolleybus route 645 started in August 1936, running between Edgware and North Finchley via Cricklewood, and in June 1938 was extended to Barnet, thus duplicating the 84 over this section. A wartime economy took place from May 1940, with the 84 withdrawn south of Whetstone, but retaining some dignity by running to Arnos Grove instead. Indeed, at weekends buses on the 84 could be seen as far away as Walthamstow (Crooked Billet). The route was cut back to New Barnet in the 1960s, allowing it subsequently to explore some new territory which was later given over to new route 84A (now the 184). Buses were also diverted to operate through Potters Bar, and the route now provides the main service between there and Barnet where once there were quite a few different, but mostly irregular, services. Although the route is not a Transport for London contract, the anomaly of red buses running well out into Hertfordshire continues, now under the stewardship of Metroline.